Over the past week, sales of detached houses and condominiums continued at a pace that’s typical for this time of the year. Saskatoon real estate agents reported 95 firm deals in those two housing categories to the Saskatoon multiple listing service®. Those numbers are down ten units from the previous week, but up 15 from sales recorded during the same week last year. 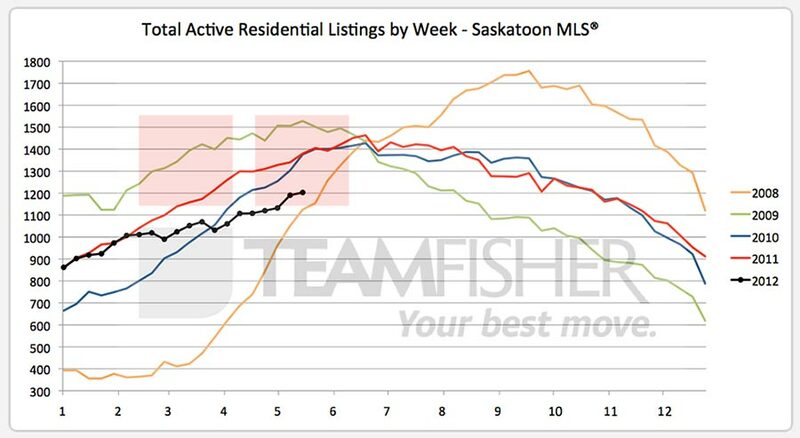 New listings of houses and condos came in at 150 properties for a week-over-week decline of just four homes but ended sharply higher than the 114 Saskatoon homes that were listed on the MLS® over the same period of time a year ago. 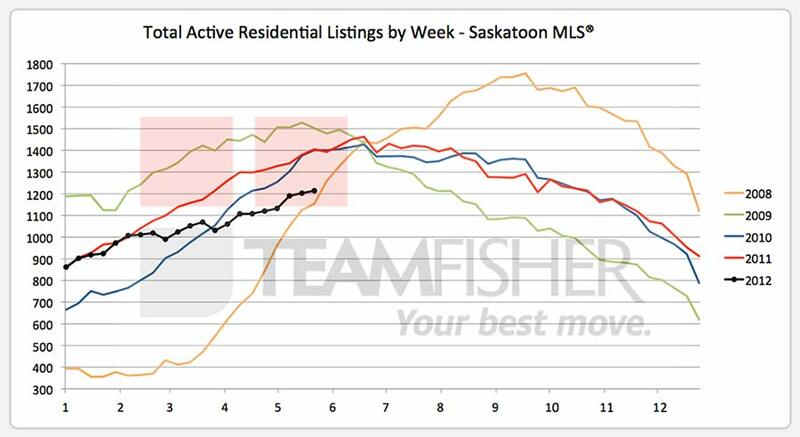 Quickly approaching the time of year at which the total inventory of Saskatoon homes available on the multiple listing service® tends to peak for the year, MLS® inventory failed to gain much traction again. The numbers grew by just 11 units over the course of the week to close at 1214, about 15 percent short of levels seen at the same point in 2011. Assuming that this trend continues, it appears that the current inventory line on our chart will break the bottom line to reach its lowest level for June in five years time. Today there are 733 single-family detached homes and just 399 condominiums bearing an active status on the MLS® system. At this time last year we had 823 houses and 509 condos available to home buyers. The average selling price of a Saskatoon home remained strong as it lost just one thousand dollars compared to the previous week and closed at $348,424. The weekly median took about a ten percent increase over sales recorded the previous week to reach $345,000. Meanwhile, the six-week average price trailed lower again, dropping just under one thousand dollars to $341,341 to claim a year-over-year gain of about twenty-two thousand dollars. The four-week median price also softened, slipping three thousand dollars over the week to $314,900 for annual growth of just under nine thousand dollars. This brings a continuation of the recent trend in which year-over-year gains to the four-week median price have been moderating. Through April, the annual gains to the four-week median were all $25K, or greater. 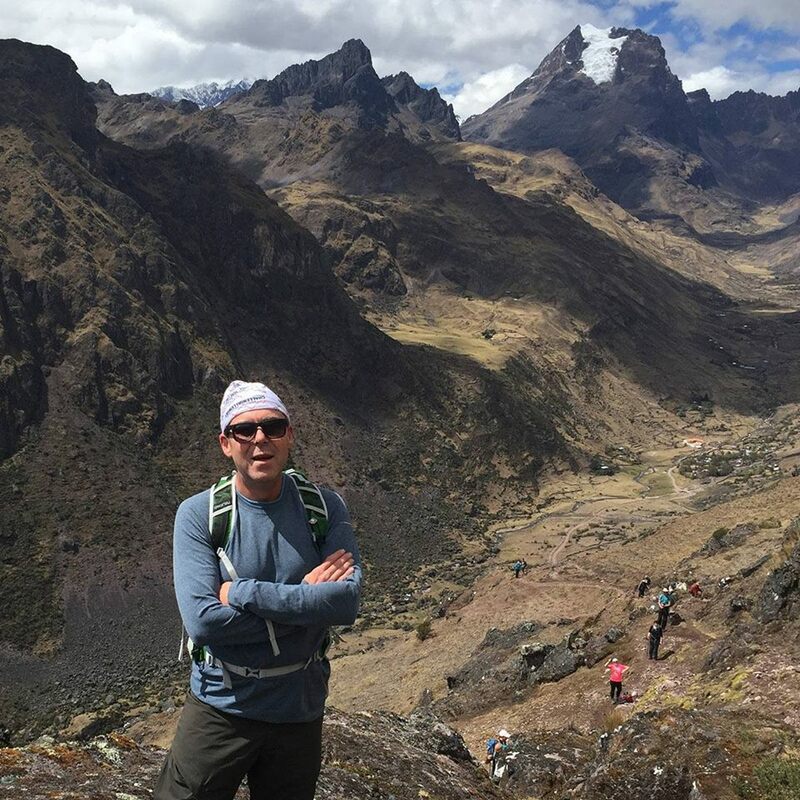 Since the first week of May, the annual growth has been running at about half of that, or less. Overbid sales accounted for less than ten percent of our sales last week with seven sellers receiving an above list price offer. On average, those sellers netted an additional $5,012 above what they were asking. 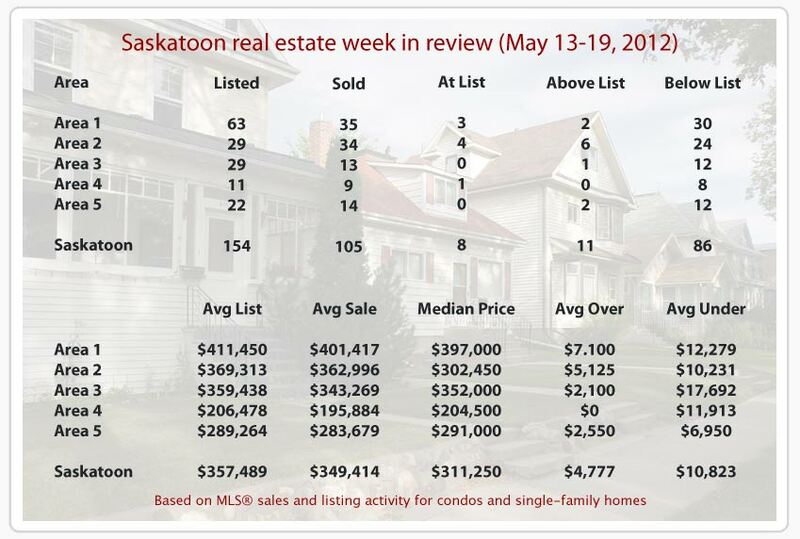 Another 11 decided to jump when their prospective buyer offered to pay them full price while 77 of the 95 firm deals reported by Saskatoon real estate agents this week came in below the asking price by an average of $8,118. 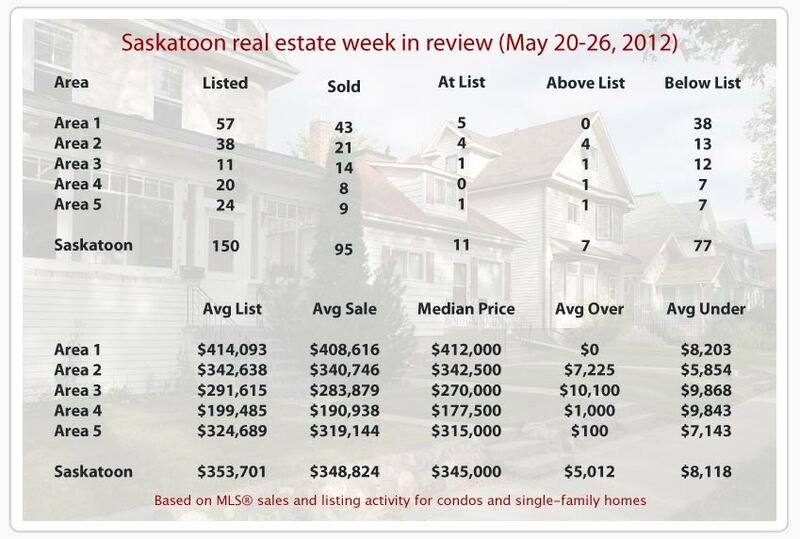 Other notable Saskatoon real estate activity this week included 44 cancelled and withdrawn listings, just 9 properties that expired from the system without a sale and 33 price changes. Residential unit sales continued to move along at a brisk pace last week as Saskatoon real estate agents reported a total of 105 firm deals to the local MLS®. That number brings an increase of nine sales compared against the previous week and growth of seven when compared against sales activity from the same week a year ago. 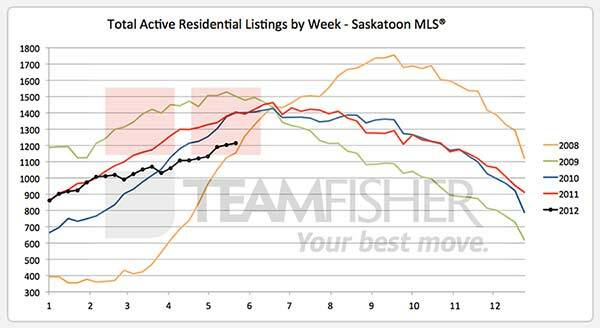 New listings added to the inventory of the Saskatoon multiple listing service® slid from the lofty levels recorded the previous week, falling by 30 properties to 154 to finish just slightly lower than the same week from the previous year when 157 Saskatoon homes were introduced to the system. Following a week that saw a needed bump to the total inventory of active MLS® listings in the residential category, inventory growth sputtered but inched higher growing by just 13 units over the week to reach 1203 properties, down from 1380 at the close of the same week in 2011. Today’s totals show 726 single-family homes and 403 condominiums available to Saskatoon real estate buyers. At this time last year, those numbers stood at 804 and 502 respectively. This would be the first time that the inventory of available Saskatoon condos has been above the 400 mark this year but it’s still twenty percent lower than it was a year ago. 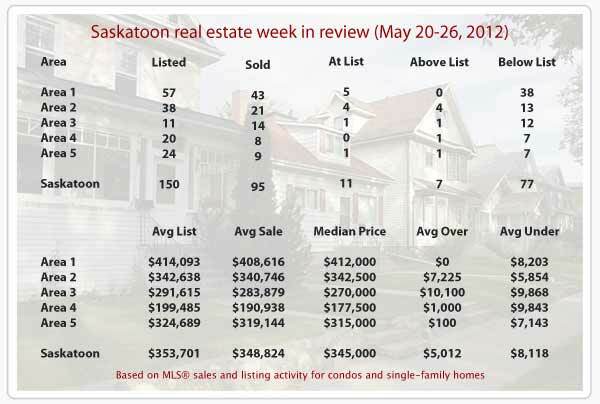 The average selling price of a Saskatoon home moved higher once again reaching $349,414 this week. The median sale price for the week moved in the opposite direction slipping nearly eight thousand dollars to settle at $311,250. After five consecutive weeks of growth at record levels, the six-week average selling price of a Saskatoon home slipped lower falling a bit more than four thousand dollars from the previous week to $342,038 for an annual gain of about twenty-three thousand dollars. The four-week median price slipped a little more falling fifty-three hundred dollars from last week to $317,900 for annual growth of about eleven thousand dollars. Over the past few weeks the annual gains to the four-week median have been moderating, coming in at about half the amount that we’d been seeing through most of the first few months of the year. The number of Saskatoon homes that traded for more than the asking price moved higher again reaching 11 this week. On average, the buyers involved in those deals paid the seller an extra $4,777 to walk away with the home they wanted. By contrast, 86 of the 105 closed transactions recorded on Saskatoon’s MLS system this week reported a price that was below the list price by an average of $10,823. Another eight home sellers made off with their full asking price. Other notable Saskatoon real estate activity this week includes 39 cancelled and withdrawn listings, just 9 properties that expired from the system without a sale and 45 price changes. CREA economist Gregory Klump reports on MLS® sales and listings for the Canadian real estate market for April, 2012. Home sales up 0.8% from March to April. Actual (not seasonally adjusted) activity stood 11.5% above levels in April 2011. The size of the year-over-year increase reflects a slowdown in sales last April following changes to mortgage rules which came into effect on March 18, 2011. The number of newly listed homes edged back 0.2% from March to April. While still well balanced, the combination of stable new listings and slightly higher sales activity resulted in a tighter national housing market. The national average home price edged up 0.9% on a year-over-year basis in April. Last week, I asked you for a product donation to Royal LePage’s National Garage Sale for Shelter. Many of you came through and we ended up with piles of great stuff to resell on Saturday at the local Royal LePage office . Thank you! The wind presented the odd challenge, and the odd bit of breakage, but the sun shone and people arrived to buy. Thanks to those who participated in that way as well. Those of us who were working the sale had a great time meeting people who generously paid for the few items they wanted to take home. By the end of the five-hour event, we were about $3,700 in the black, not a bad haul when you’re dealing with revenue that comes in as quarters, loonies and toonies. That money will be donated to the YWCA Crisis Shelter and Interval House where it will go to work helping woman and kids who have experienced abuse at home make a fresh start in a safe place. Again, thank you so much. Similar efforts were conducted at Royal LePage offices across the country. When we have a total tally of proceeds raised, we’ll let you know. The Royal LePage Shelter Foundation is Canada’s largest public foundation dedicated exclusively to funding women’s shelters and violence prevention and education programs. Administrative costs of operation are underwritten by Royal LePage so 100% of proceeds raised through commission based donations from agents, and community events like our garage sale and our funspiel go directly to the shelters we support. Since its inception, Royal LePage agents and brokers have contributed or raised over $14 million to help end family violence for more than 30,000 women and children who take refuge in a shelter each year. If you missed out on the sale and would like to make a financial contribution, however large or small, you can do so at the Shelter Foundation website.